Guests staying in cozy log cabins in Branson will not just enjoy a relaxing and comfortable stay in a secluded area in a tranquil environment but also an unforgettable vacation experience. The convenient location of these log cabin accommodations gives guests easy access to theaters that host world class live entertainment shows, shopping areas, restaurants, museums, and many exciting attractions. This log cabin accommodation provides a comfortable and luxurious living for the whole family who wants to enjoy a relaxing and wonderful vacation at any time of year. Most guests who have stayed in log cabins in Branson described it as warm, homey, and inviting. The comfort and convenience that you can enjoy in staying in a log cabin accommodation allows you to enjoy complete satisfaction that may surpass your expectations. Thousand Hills not only provides a comfortable and luxurious way of living but also the opportunity to enjoy exciting indoor and outdoor activities around the area. The spacious 1,150 square feet floor plan of every log cabin in Branson allows you to experience a comfortable and convenient living. Each bedroom in each log cabin features superior quality king beds with 100 percent cotton sateen, comfy pillows, 400 thread count sheets, and plush blankets. As guest of a comfy log cabin accommodation, you can have the chance to play with the most popular 18-hole golf course in Branson. The beautiful location of your log cabin accommodation near the golf course is one of the reasons why many guests fall in love with it and make them think of returning back in the future. All of the log cabin accommodations feature nice closets with double mirrored doors, private bathrooms with hairdryers, doors, lots of drawer space, ceiling fan, and clock radios. The master bedroom of every log cabin features large rain shower, a separate toilet with jetted tub, and other additional vanities. The living area of the log cabin features a sofa sleeper so that extra guest can be comfortably accommodated. The cozy log cabin accommodation also features top quality amenities such as free wireless internet access, flat screen digital TV with HBO, and a DVD player. 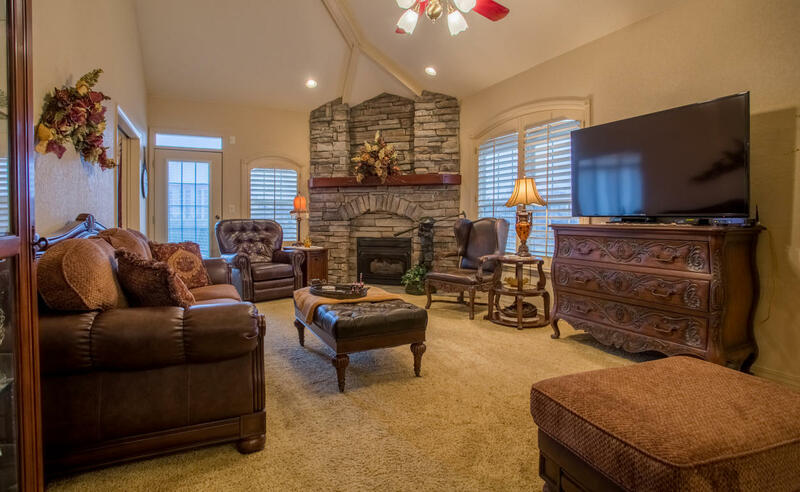 Your wonderful stay in a log cabin in Branson that you have been dreaming for so long is like no other that has all the perks that come with excellent amenities and complete kitchen furnishings. With the fully equipped kitchen of every log cabin, meals can easily be prepared even for a big group of 8. If you are staying longer than expected, you don’t have to worry if you run out of clean clothes as the kitchen is furnished with washer and dryer which allows you to clean dirty clothes conveniently and that you don’t have to worry of bringing home dirty personal belongings. These cozy log cabins in Branson are the most widely patronized accommodations at Thousand Hills Hotel & Resort because of its beautiful location near the foothills of the Ozark mountains and with easy access to pristine lakes.